I went out railfanning early in the morning of March 23, full of hope for a good morning of photographing trains and flying my drone. At least the day started well. I set out along the CN Rivers subdivision at sunrise. My thought was to get far enough away from the Winnipeg airport that I could fly my drone – either near Winnipeg or at Elie. Under current drone regulations, you have to be 5 nautical miles from an aerodrome and you can’t fly in controlled airspace. You basically can’t fly a drone anywhere in Winnipeg at all without a special flight operations certificate (SFOC), and since I don’t have one of those… I have to get out of town to fly. I stumbled across CN 2843 East right away. I wasn’t in the “drone zone” and I didn’t have time to deploy it anyway, so I just took photos. I turned around and took the “going away” glint shot, which I like very much. Lest you think CN 2843 was doing all the work, let’s not forget CN 2278 working hard as the mid train DPU. That was exciting, and a good start to the day. I carried on westward. I decided to set up at mile 16.3 at a lightly used crossing. It was too cold to stand outside and wait, so I sat in my car, listening to podcasts. After a while, I got out to look for trains. There was a westbound coming, a lot closer than I would have liked! I ran back to my car, grabbed my camera and drone stuff, then ran across the crossing and threw everything down, getting ready to get the drone aloft. It turned out that in my haste to get in position, I brought the drone’s controller but not the drone itself. I put the controller down and took photos. I always wonder if the crew is laughing at us railfans, fumbling with our gear as they approach. I hope not, but I wouldn’t blame them! After that fiasco, I decided to head west and maybe fly the drone outside Elie. Around mile 18, I saw a headlight in the distance, so I backtracked to the same crossing at mile 16.3. I unpacked the drone and got it aloft, and flew it west a bit to wait for the train to show up. Meanwhile, I got my still camera ready. The train wasn’t exactly rocketing along, so I had to wait a few minutes. I stopped recording from the drone so I didn’t have several minutes of useless footage. That turned out to be a mistake. As the train approached, I turned the recording back on. I turned the drone as the train passed, then I took a few stills with my camera, then flew the drone up a bit. It was about then that I realized that my drone wasn’t actually recording anything. I had spent a few minutes carefully tracking the train, and flying the drone around, but not recording any of that. I probably said a bad word. I turned the recording on and recorded the rest of the train. It’s in the video here along with the “before” video and a few stills. 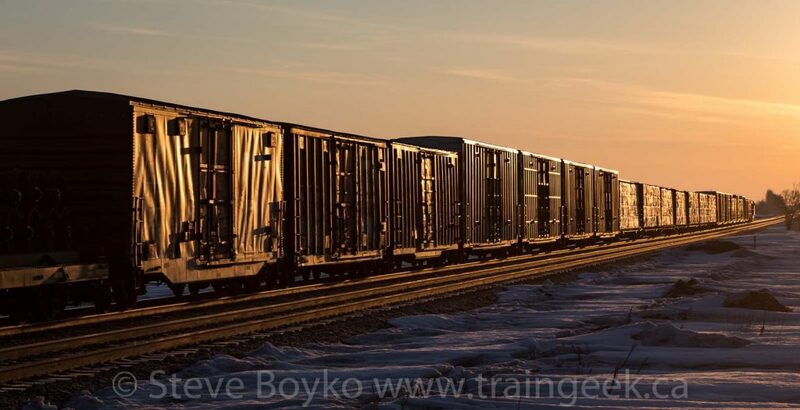 You’ll note from the “thumbnail” above that the train had a bunch of distributed braking boxcars and containers in it. I think these were heading to Transcona for storage, now that it’s warming up and they aren’t needed. I was more than a little annoyed at this point. Two opportunities for drone photography – both missed. At least I got some flying practice with the last train. When I went to launch the drone, it refused to launch – insufficient power! All that waiting in the air for the previous train to arrive drained the battery and I only had 25% power remaining. I knew it was low but I had hoped I would have enough to get up in the air and take stills, if nothing else. No dice. Back to the trusty camera for a pretty backlit photo. I’m not in love with the Moire pattern in the sky. Nice to see a cowl unit leading and a leaser too! After the train passed, I headed to Portage la Prairie. 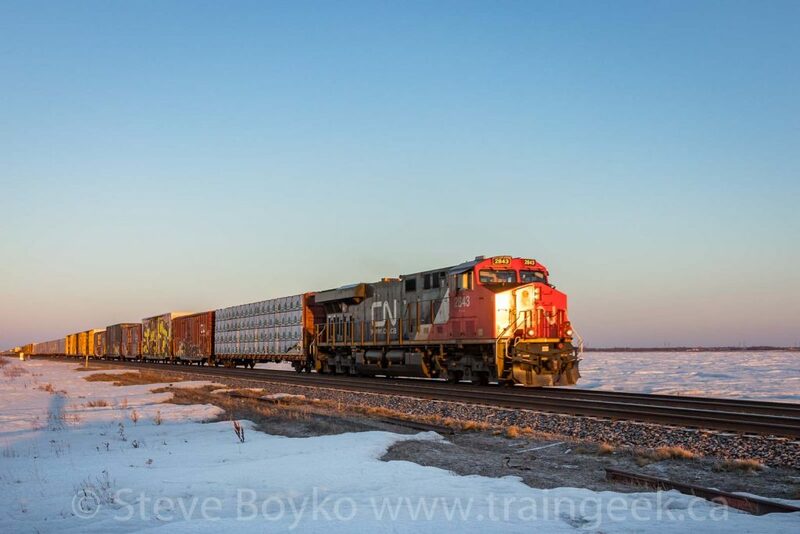 As I approached the city, I saw a westbound CP train passing the Tucker grain elevator. I continued on the Trans-Canada Highway around the city to the west side. I meant to take the Can-Oat road off the highway so I could get right to the CP tracks and wait for the train, but I missed it. I took the regular exit instead. I didn’t see the train yet, and I knew I would be shooting right into the sun. I thought maybe I could get to a crossing I knew where it was at an angle and the sun would be on the side of the train. It turns out that I didn’t have time for that! One quick U-turn and I was driving back toward Can-Oat Road to try it there. I didn’t get there in time and I watched a CP locomotive and a UP locomotive flash through the crossing. No photos. I drove toward the centre part of town, thinking I might see a train near the CN or CP stations. 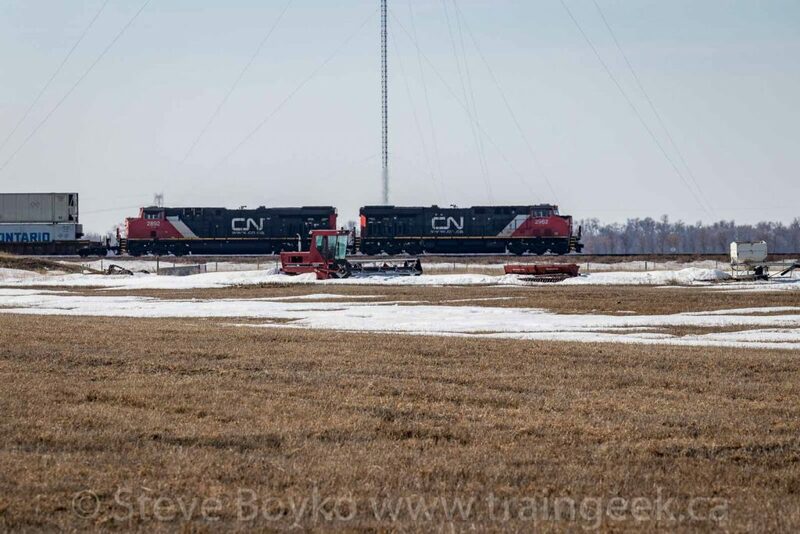 As I approached West Tower, I saw two trains – another westbound CP train and CN 2423 West, the train I saw in Elie. I parked the car quickly and photographed the CP train – badly. BNSF 9744 was leading CP 8122, CP 5039 and CP 6304. 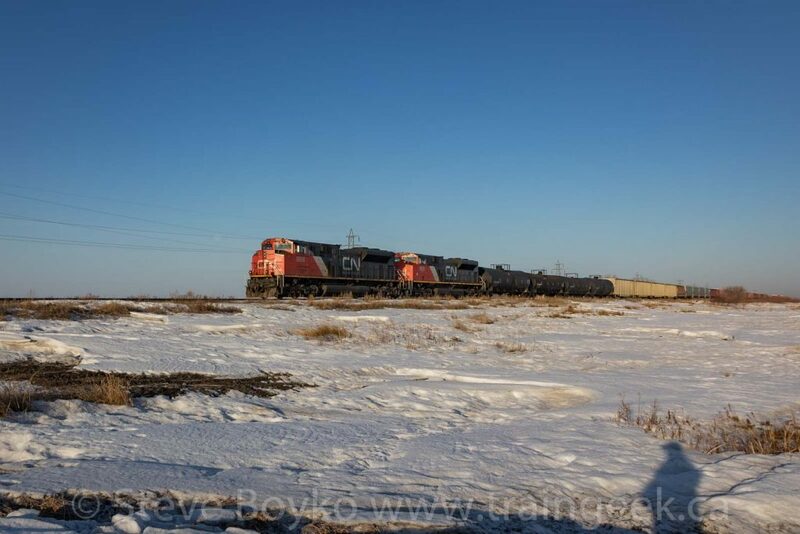 15 seconds later, CN 2423 and GECX 7367 rolled by in front of me. After those trains rolled on by, I went by the museum in the former CP station and noted that CP 2238 was the resident “Portage switcher”. There was a string of CP ballast hoppers west of the overpass. 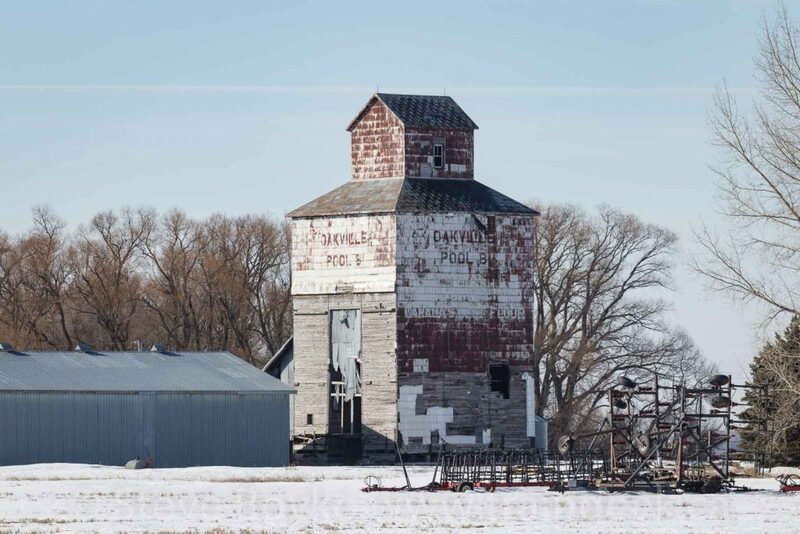 As I dejectedly headed east toward Winnipeg, I took a few moments to update my photos of grain elevators along the way. 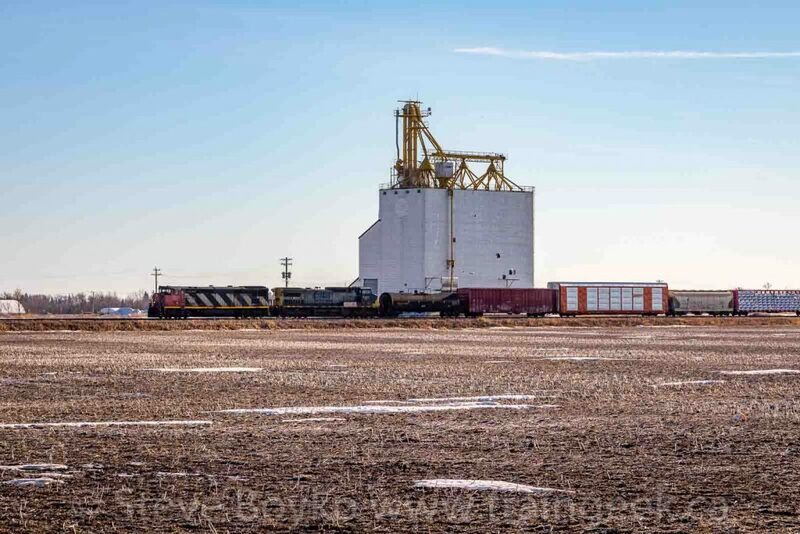 I photographed the Viterra grain elevator just east of Portage (Tucker), and the former Oakville Pool “B” elevator above. I’m glad I did photograph that elevator, because it was demolished within a week. Just on the east side of Elie, I saw a westbound container train. 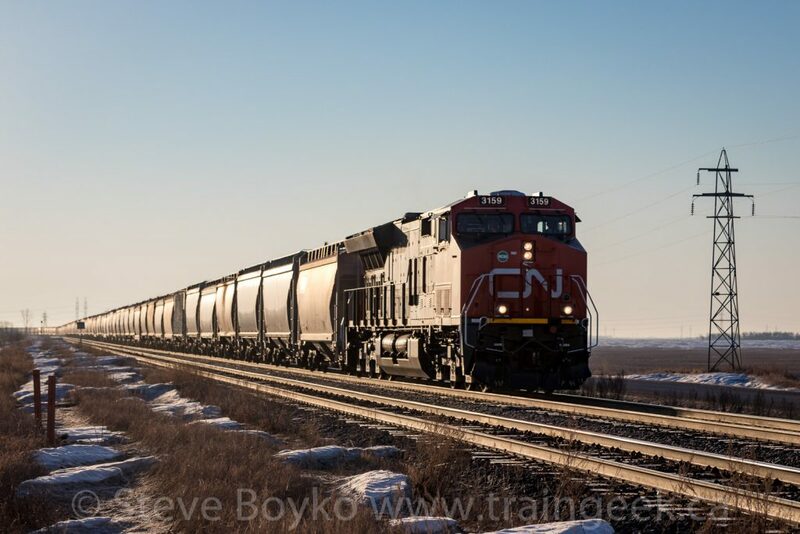 I pulled off the road to take a long distance shot of CN 2962 West. Although I had a string of bad luck and/or poor judgement, I did end up with a few photos that I’m happy with. It wasn’t a total loss. You are experiencing many of the drone issue that I have as well when I first started out. I found the biggest difference to get used to was the amount of setup time for a drone shot compared to a regular dSLR shot. Hi DaveM, I agree – it takes a lot longer to get ready to take a photo with a drone than with a DSLR. Power on the controller, power on the drone, connect the phone, wait for everything to synchronize, launch… it’s a lot more than hitting the “on” switch! In the shots with the trio of CP units and GECX, there is a plaque in the foreground. Any idea what it says? I’ve never seen that plaque when I’ve been watching trains in Portage. Hi Sheldon, it took a bit of CSI-like image enhancement, but I can see it is about the Campbell’s Soup plant that used to be in Portage. Thanks for the info Steve. I was hoping it was something about the railroads of days gone by. Sometimes, the safe option is the best option. Also, having ATCS Monitor available while out is good. I have it indirectly on my phone, using Chrome Remote desktop. Of course it’s probably less useful outside the city, but still. In fact, the ATCS got me a GWWD catch recently. I used the ATCS Monitor a bit but the coverage wasn’t great. I’m glad you have found it useful.